Want to add some life in your blank wall? I also had a blank wall in the dining area, opposite our dining table but I have chosen to make a wall mural instead of putting some nice picture frames. The bright orange color complements my choice of plain white tree mural with a bit of black and gold accents. But if you want another option, I think this double wall art decor will be a great idea, too. You can buy some shadow boxes from your local book store and some bright colored papers to be used for the background. 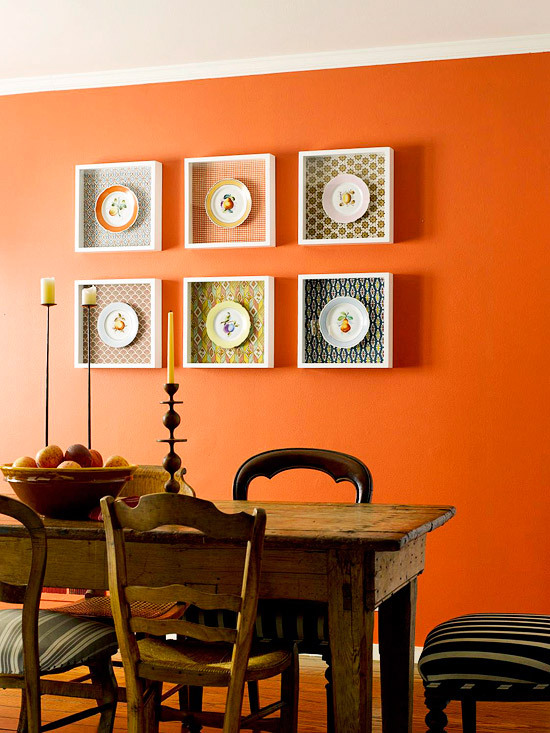 Then you can choose some nice pieces from your collection of plates, have these mounted inside the shadow boxes and voila!, you'll have an interesting wall art for your dining room. This is really an easy way of putting some life on a blank wall using your creativity and some interesting stuff that's already available in your homes. I think this one is really a cute and fun idea!